Good Seed CSA is a subscription based market located right on the farm. Members of Good Seed come by the farm weekly to choose from a selection of freshly harvested organic produce for their home. By choosing to be a member of Good Seed, you cut out the middle man and become engaged directly with the farm where your food is grown. When you come by the farm to pick up your weekly produce, you know that what you are getting is the freshest, most nutrient dense vegetables and fruit for you and your family. All produce offered is grown right on the farm just yards from the market space. It is harvested hours before you pick it up, so it is the freshest produce you could purchase. You will be able to talk directly to your farmer to learn more about how your food is grown. How does Good seed csa work? When you sign up to become a member of Good Seed CSA, you will be contacted by Tracy, who is one of your farmers. 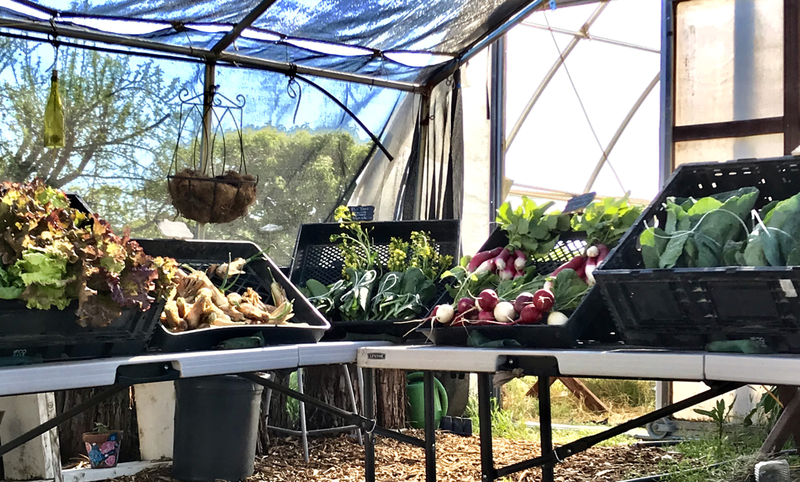 Once your subscription season begins, you will be asked to come out to Genesis Organic Farm Tuesday evenings from 4pm - 6pm to pick up your weekly produce. You will get to choose from a selection of freshly harvested vegetables and fruit to fill your shares for that week. A weekly menu will be emailed out to members prior to pickup so that you will be able to plan meals before you pick up your food. Sign ups are down below on the page. To secure your membership, a down payment of 1/4 of your membership cost will be needed by your first pick up. Pick up location is at Genesis Organic Farm 7595 Central Valley HWY Hanford, CA 93230. The market space is located under the shade next to the big green house. When Do I pick up my produce? Every Tuesday evening from 4pm - 6pm. We accept all major credit cards through Square. We also accept cash or check. Checks need to be made out to "Genesis Organic Farm." Payment plans can be worked out on a case by case basis. Shares are determined by how much is harvested that week coupled with current market pricing for each crop. Can I purchase extra shares? Yes; extra shares will be available to purchase at current market pricing. I'm going out of town; what happens to my shares? Ideally, we would appreciate being notified when you will miss a pick up so that we do not harvest too much food. If notified in advance, we can work out how to handle your missed shares. In the past, members have simply picked up extra shares in future weeks; or they have transferred their membership to friends and family while they are out of town. Summer Season Begins April 3, 2018 and runs until November 20, 2018. What will we be growing this year? DISCLAIMER: Though we work to insure that we have the most productive harvest humanly possible, farming is never a guaranteed outcome. If an emergency arises that cuts the season short, your membership payment will go towards sustaining the farm. You will be offered compensation in the form of extra shares or a discounted rate in future seasons. * Not all vegetables may be available this season.